Hi! 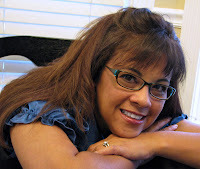 Jen Matott here again...I have a project to share with you today! I have used Gelatos on many surfaces but when I saw this little wooden drawer set, I had my creative boundaries pushed. I decided to alter it with the Gelatos, gel medium, and the Stamper's Big Brush pens. I also threw in some modeling paste to create some raised areas. First, I collage some papers onto the wooden surface with the gel medium as the adhesive. I tore some sheet music, book pages and other scraps. Once they were dry, I added blues and greens to the wood with the Gelatos. I was not too careful, I just scribbled them on and added water to blend. If I saw an area that needed more color, I added more while it was wet and blended. After I finished, it reminded me of Claude Monet's "Waterlilies" paintings. I found a quote by Claude Monet and stamped it over the drawers with individual letter stamps and the Stamper's Big Brush Pen in black. Next, I added some Modeling paste over stencils from the Crafter's Workshop. I used a palette knife to scrap it over the stencil evenly and pulled the stencil off and it left a slightly raised image. I used a wash of gold watered down Gelatos over the dried paste to tint it. Finally, I added a nest on top with flowers and bling to create a bubbles and garden look. I'm ready to hid little treasures in the drawers or secret little notes. I hope you enjoyed this project and will try out our Gelatos and pens on wooden surfaces! Live Demo with Tiffany Johnson! This Friday September 30th 12:30 pm EST - Tune in to Oh My Crafts Ustream Channel to see design team member Tiffany Johnson demo live. She will be showing you all kinds of fun techniques using the Stamper's Big Brush. Start by rubbing a little yellow and orange gelato to the middle of the watercolor paper. Blend in with water in circular motion. Let dry. Ink the light bulb stamp with Scarlett Red Stamper's Big Brush marker and stamp into the middle of the watercolor paper. Ink the sentiment ‘You Light Up My Life!’ using Warm Grey and Scarlett Red Stamper's Big Brush markers and stamp below the light bulb. Attach the watercolor paper piece to the middle of Grey patterned paper. Attach the whole thing to the card front and sew around using a sewing machine to finish the card. Have a great day! Design Memory Craft is now at Archiver's Annex!!! Now you can buy Design Memory Craft products online at Archiver's Annex! You can also find a selection of our Mix & Match Art GRIP Watercolor and Color Pencils in Archiver's stores now. 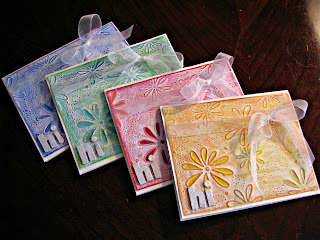 It's Technique Tuesday again here at Design Memory Craft and I'm here to share a technique using the Gelatos. This is such a fun way to create artwork! I am an elementary art teacher as well as an artist. Many of my techniques are inspired by things we are doing in the classroom. One of my favorite projects are those with printmaking supplies! I love the idea of making copies of artwork that are unique and magical. There is little that is as magical as printmaking. It's just amazing to kids and adults alike. This technique is one that makes "one of a kind" work! Monoprinting (mono= one) is one of those techniques that has magical qualities! You create an artwork on a slick surface and pull a print or two of the artwork. Each print is unique and cannot be reproduced the exact same way again! I love using Gelatos to create these unique art prints. I start with a clear piece of plexiglass (you can use glass, acetate, or thick plastic too). Draw directly on the glass using Gelatos to create shapes, images, and textures. I also like to use templates, stamps, and found materials to create interesting textures/ design. For this project, I drew freely on the plate and then stamped with bubblewrap, corregated cardboard and toilet paper rolls. I wanted an abstract design. Once, I created my base design, I could take a Q-tip and draw into it for some negative space. The beauty of this kind of monoprinting is that the Gelatos give you unlimited work time! No worries about ink drying too fast! You can work on this for days if you want. They are water-soluable so they will work no matter how long they sit! Finally, I spritz a sheet of heavy watercolor paper and lay it over the design careful not to over saturate the paper. It should be damp with no puddles. Puddles or too wet paper will create a blurred image. Slightly damp paper will allow you to capture details more clearly. I use a wooden spoon or a printmaking baren to rub over the back of the paper to transfer the design. Peel the paper back by the corner carefully. You can then pull a "ghost" print with the remaining color or add more details prior to pulling another print for another unique artwork! Kids love this technique and even my 2 year old can do this! It's super exciting to see what we get when we reveal the artwork! Try doing this over newspaper or other printed papers. I'd love to see what you try! Hi! It's Jill here to put you in the Christmas spirit with a holiday card. It's never too early to start thinking of those handmade Christmas cards. Starting early keeps it fun and stress free! The flowers, Penny Black Christmas Pride, were masked, stamped and then colored using Stamper's Big Brush Pens. Even the black background was colored using the black Stamper's Big Brush Pen. I love how bold and vibrant these markers always are. Add a touch of stickles on top and you are good to go! Need a quick card? How about a gift? A set of cards? how easy these cards are to make! Art GRIP® color pencils. After you have your base color go back over some of the areas with a little more pressure.You could even mix and match some of the colors! Add a ribbon and sentiment and there you have it! Artistic, original and easy peasy! For variations try with Gelatos or Art GRIP® Aquarelles and spritz a little water! 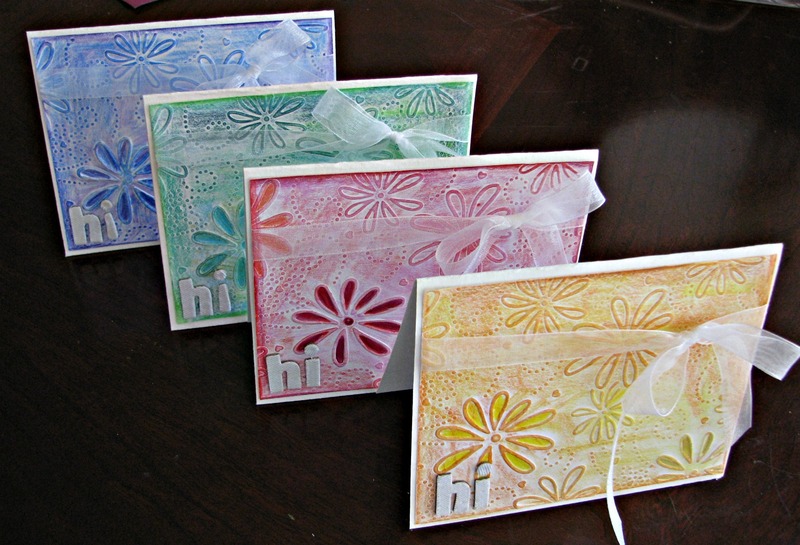 Simply emboss your card with an embossing machine and folder then lightly color the entire page. After you have your base color go back over some of the areas with a little more pressure. You could even mix and match some of the colors! For variations try with Gelatos or Aquarelles and spritz a little water! Colleen here to bring you a fantastic idea using my favorite papers. Don’t you just love lace scrapbook papers! I just can’t bring myself to cut them… So I’ve created this Lace Canvas project! Start with a blank canvas and any of your favorite Design Memory Craft PITT® Pens. Hold the paper over the canvas and start filling in the white areas. Remove the lace paper and see the design! You can also fill in the white area with another PITT® Pen color. You can try various size canvases, PITT® Pen color combinations and different lace paper designs to make beautiful canvas wall art. Happy Creating! Happy Tuesday! Hope you all enjoyed an extra long weekend being creative. Seems everywhere you turn these days you see mixed media art and collage. We just love it! That's why we were sure to include the Textural Accents Sampler to the Mix & Match line. These little babies are awesome and can be used so many ways. Did you know that you can tint Gesso? Yup. Sure can. You can add some color by mixing in a bit of Gelato or Art GRIP® Aquarelle. Just lay down a nice patch of color and mix in a bit of water, then add some Gesso to create a tinted primer that looks great on chipboard, wood, canvas, you name it! Gel Medium adds tons of texture. You can squeeze it out into lines like cake icing. Or, apply some in patches and scrape it away to make lines and crosshatching. That's called sgraffito. When the Gel Medium is dry you can add Gelato or Stamper's Big Brush right on top! Glaze is a great way to add some sheen to otherwise dull surfaces. Try it on top of newsprint or old book pages to add abit of luster to normally matte papers.